Five-story, blue and white, “stick-style” buildings fronting a white-sand beach bordered with soft sea grass bring to mind late-nineteenth-century Cape May. In the airy lobby are high ceilings and limestone flooring centered by a seahorse chandelier, and ocean blue chenille seating creates a bit of a seaside ambience. Please don’t expect a calm atmosphere anywhere near the lobby since there always seem to be crowds of diners waiting their turn at the popular Cape May Café. 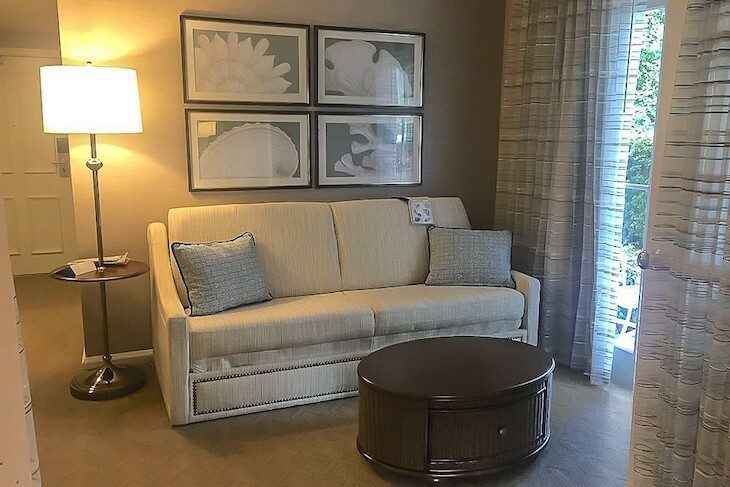 For peace and quite head outside where white rockers invite you to sit on the back porch, or to the sunny solarium with views of the resort’s lovely gardens and the next-door Disney's Beach Club Villas where a variety of crape myrtles, gardenias, and roses reside. The resort’s highlight is the fantastic Stormalong Bay, a winding wonderland of a small-scale water park shared with Disney's Yacht Club Resort. Since this is the closest resort to Epcot® it offers super easy access to the International Gateway entrance, a convenience that can’t be beat. 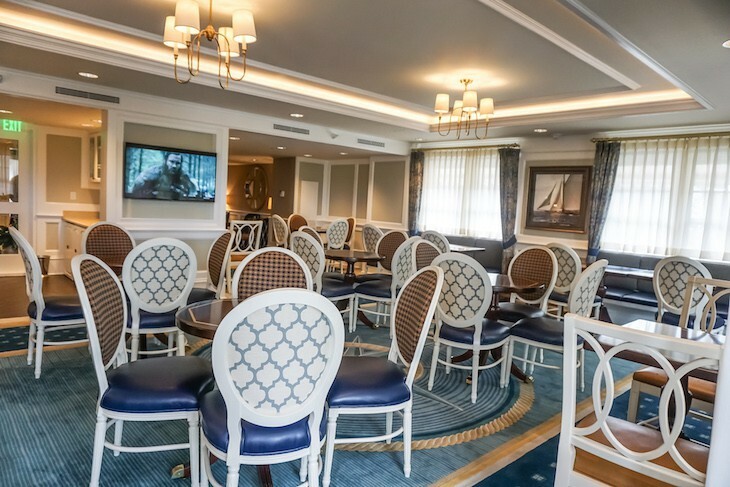 If room balconies are an important component to your vacation then choose a room over at the Yacht Club instead where full-size balconies are found in every guest room (the majority of Disney's Beach Club Resort's room balconies are standing-room-only). And if you prefer a quieter, less bustling environment, once again, I would choose the Yacht Club Resort where a calmer setting is the norm. 583 rooms.1800 Epcot Resorts Boulevard, Lake Buena Vista 32830; phone (407) 934-8000, fax (407) 934-3850. Check-in 3 p.m.; Check-out 11 a.m. 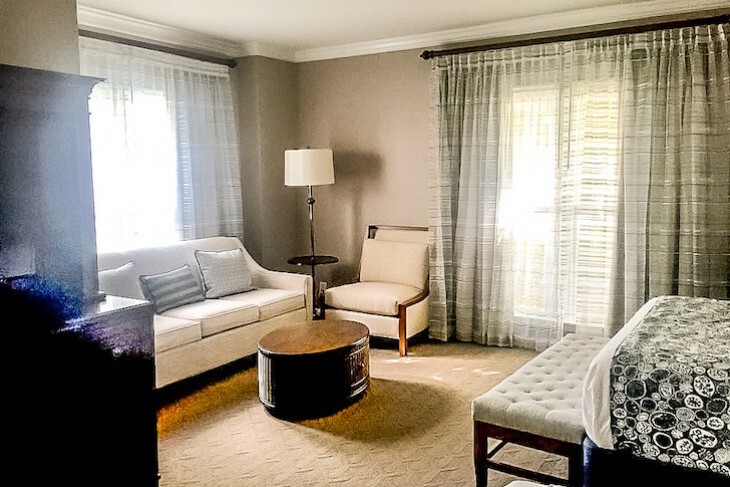 The guestroom in the suite is almost as large as a 1-bedroom suite with a separate seating area. Only one bedroom sleeping two guest. 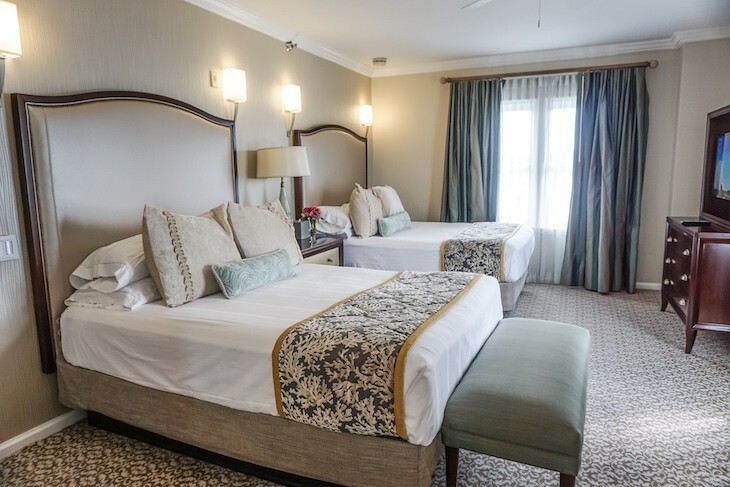 Revamped in a more clean and neutral style with splashes of color in bright teal entry doors and beds with pale sea blue leather headboards trimmed with mother-of-pearl. New taupe carpeting and wallpaper lends a soothing and fresh palette, and beds are topped with white sheeting, a navy and white bed runner, and a teal bolster. Built into an oversized, dark wood bureau topped with black faux marble is a flat-screen TV. In the room’s corner sits a work desk. 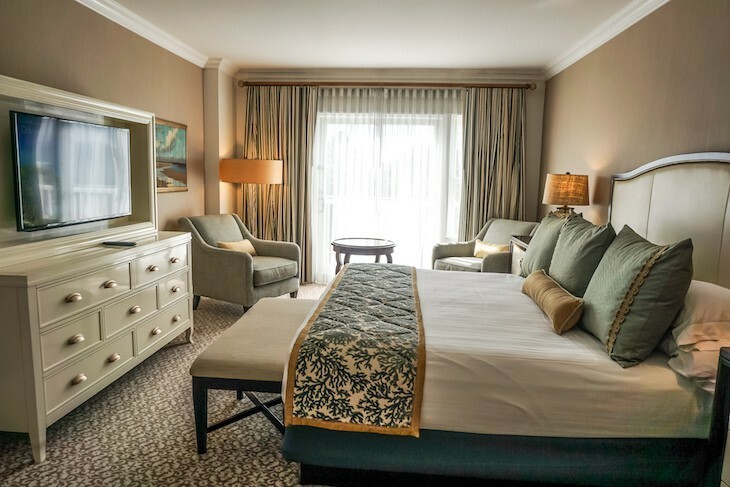 Most rooms have two queens, some with a single sleeper sofa sleeping five people; king-bedded rooms come with a single sleeper sofa and an easy chair. 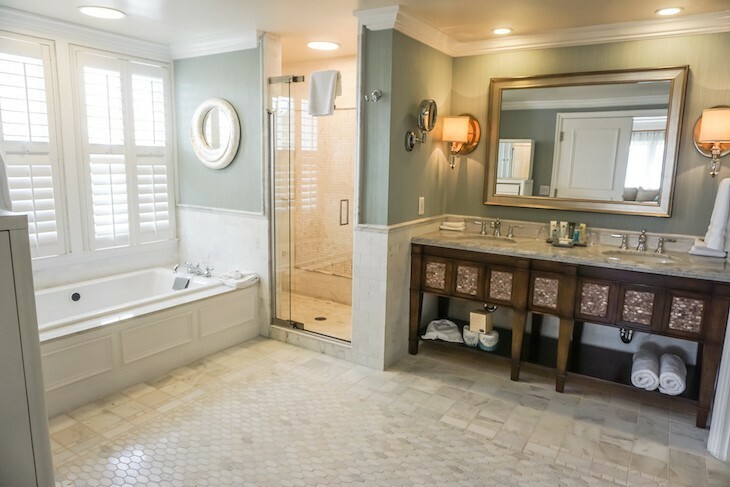 The bath has two parts, each with faux planked flooring: outside there’s nautical striped textured wallpaper, a porthole effect, open shelf vanity with double sinks, and full-length and a lighted makeup mirror; a separate room holds a toilet and tub/shower surrounded with taupe marble lined with mosaic tile. 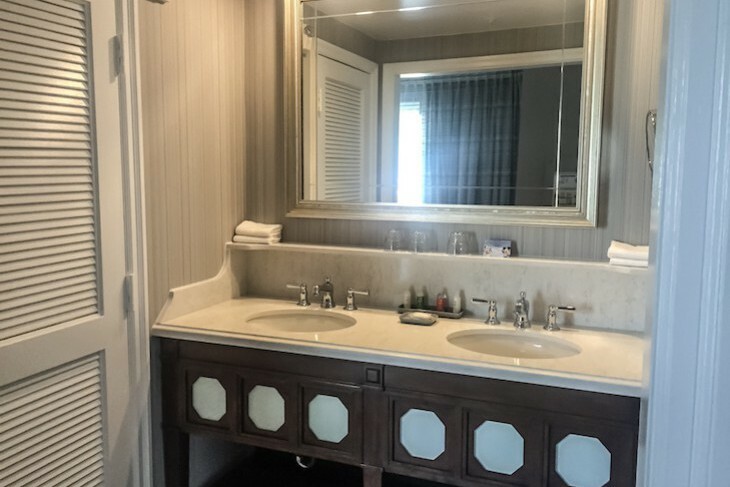 Amenities include H2O Grapefruit Bergamot bath products, an electronic wall safe, iron and ironing board, coffeemaker, refrigerator, and iHome docking station clock radio. Cara's Tip: Remember, standard-view rooms will have a view of the parking lot and the front of the resort, possibly even the valet area. 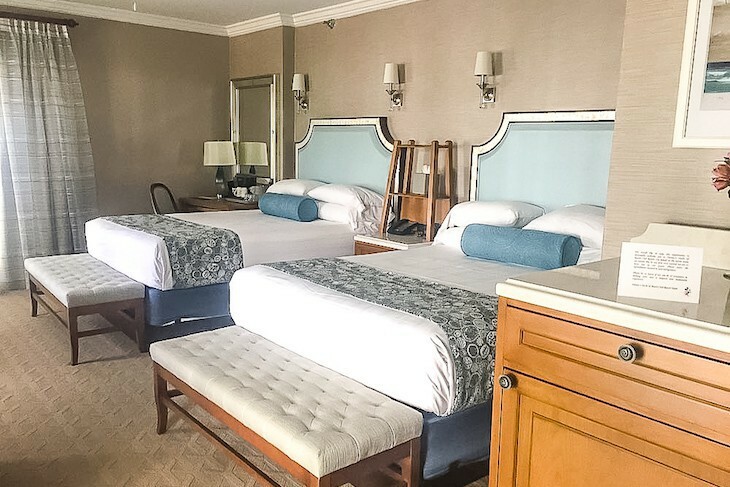 Fifth-floor concierge-level rooms include the amenities of the Stone Harbor Club, a recently expanded and much improved lounge, decorated in teal and sea blues with hints of chocolate hues and featuring several stand-up balconies overlooking the front of the resort. Complimentary food and beverages are offered throughout the day. 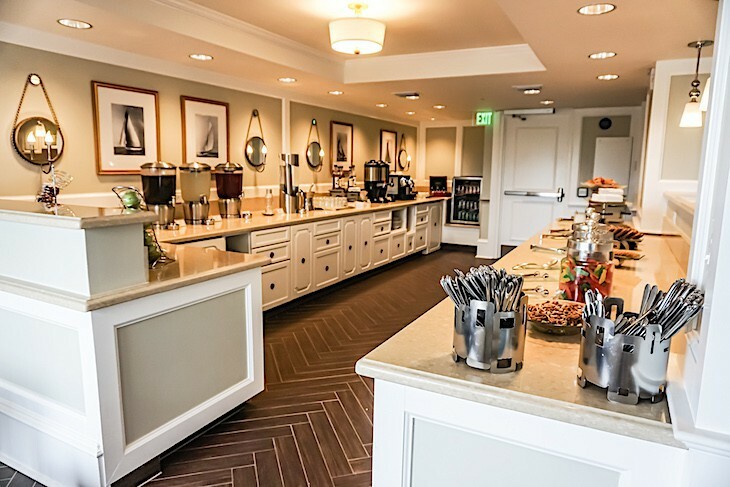 Mornings bring coffee with a self-service Nespresso machine, juice, muffins, pastries, oatmeal and fixings, cheese grits, a variety of yogurt including Greek with homemade granola and slices almonds toppings, charcuterie and cheeses, hard-boiled eggs, quinoa fruit salad, fresh fruit, and cereal. Midday Seaside Snacks consist of homemade potato chips with garlic peppercorn dip, multigrain bread and crackers, red pepper hummus dip, Swedish fish, chocolate-covered pretzels, trail mix, fruit, cookies, lemonade, and iced tea. Wine is served by an attendant with choices of Placido Pinot Grigio and Grayson Cellars Chardonnay and Pinot Noir along with an assortment of beer. Hors d’oeuvres include such items as a variety of hummus, sundried tomato pesto, marinated olives, crudités, artisan cheese with multi-grain bread and crackers, cherry tomato and mozzarella cheese salad, quinoa fruit salad, poached pear with blue cheese and Serrano ham, Greek salad, chickpea salad with feta and roasted garlic, and citrus shrimp salad; along with hot items such as spicy spinach and paneer cheese samosas, potato and pea samosa with mango chutney, crab Rangoon with sweet chili sauce, and bacon-wrapped scallops (kids feast on make-it-yourself peanut butter and jelly cups with Parker House rolls and apple slices with caramel dipping sauce). After dinner is a selection of cordials and desserts such as panna cotta, Sacher torte brownies, lemon chiffon cake, red velvet cupcakes, Oreo cupcakes, krisped rice treats, and sugar and chocolate chip cookies. 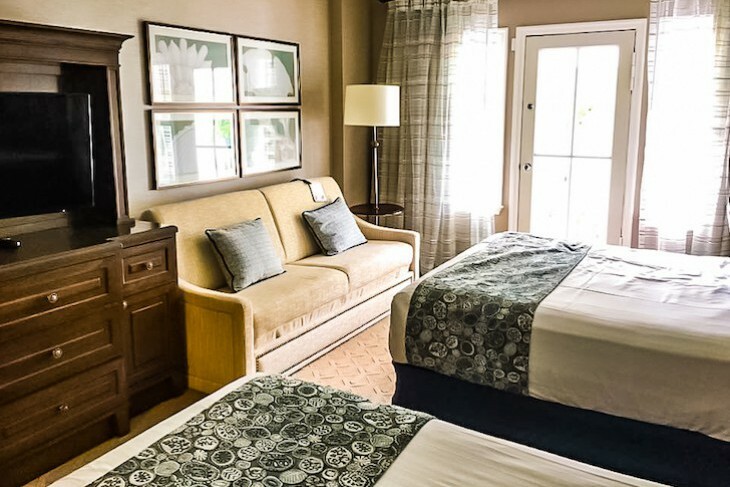 Additional room amenities for concierge guests include the services of a very friendly concierge staff, private check-in and checkout, H2O Spa Sea Salt bath products, and nightly turndown service. 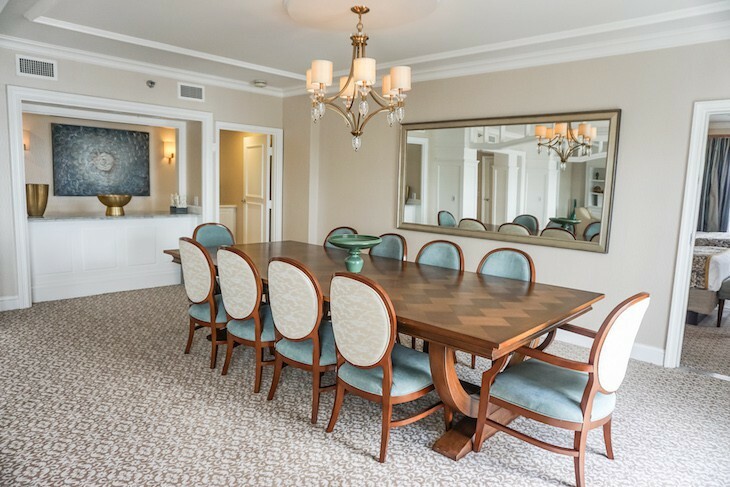 Located on the same floor as the 5th-floor concierge lounge, the 2,200-square-foot Presidential Newport Suite has been transformed into a real beauty. Sleek, minimalistic and modern, it is almost unrecognizable from its former self except for the entry hall flooring and layout. Enter through a terra cotta marble entry to the great room where it seems something is missing. Strangely enough, not one stick of furniture or accessory is placed in the gigantic marble space between the living and dining rooms. I think perhaps a round table with a floral display is called for—anything to fill the gap. But only a minor criticism for what is a stunning top-to-bottom renovation. 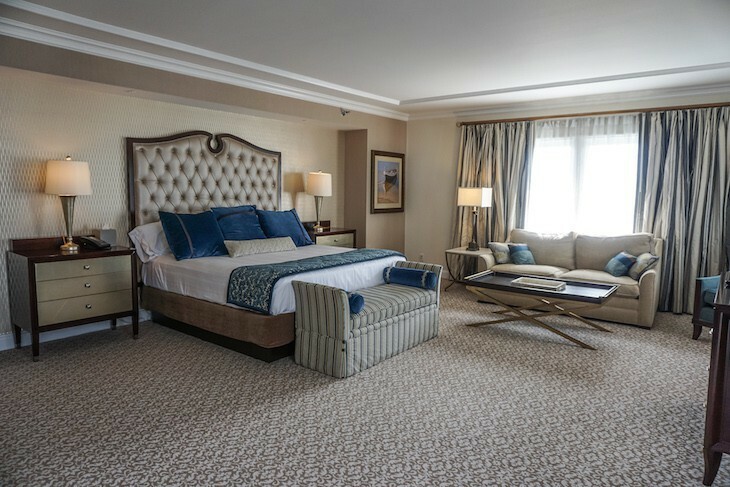 Overall the spacious suite’s palette is one of neutral tones with splashes of sea blue and fun gold accents. On one side of the great room is the cozy living area centered by a gas fireplace with mother-of-pearl surround. Place around the fireplace is a beige chenille sleeper sofa and a plenty of cushy easy chairs. A stand-up balcony runs the length of the great room overlooking charming Crescent Lake. The opposite side of the room holds a massive dining table seating 10 with sea blue seating. A service kitchen is nearby with an undercounter refrigerator and pass through bar, and just around the corner out of site is a service kitchen with microwave, toaster, Keurig coffeemaker (no sink however) and another entry, perfect for room service to enter unobtrusively. Off the entry hall is a half bath. 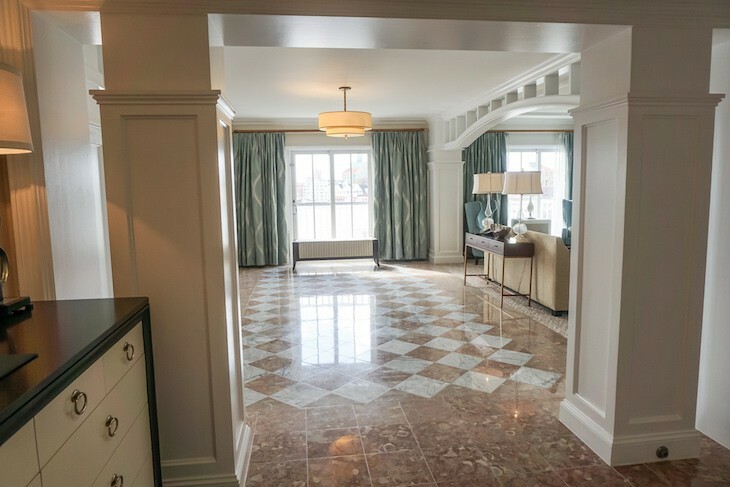 On either side of the great room sits the suite’s guest and master bedrooms, each with it’s own entry. The master bedroom is so large that even a king bed, full-size sleeper sofa, oversized coffee table, easy chair, desk, bureau, and another TV cannot fill the space. The bed is made with white sheeting, royal blue chenille pillows and coral motif runner in blue. A lofty headboard is covered in soft gold leather, and the hard furnishings are a striking brushed gold metal mixed with dark wood. 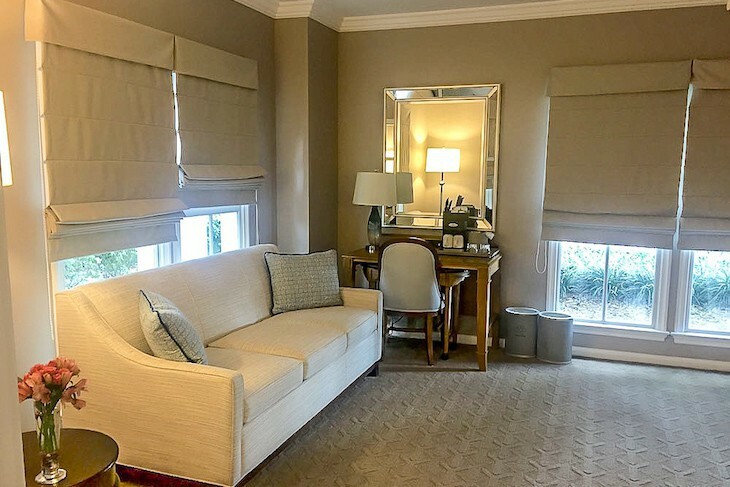 Another lengthy balcony can be accessed from this bedroom with views of a garden area and the pool in the distance. The master bath is a welcome change from it previous incarnation of bizarre wallpaper and mismatched marble. Now it’s outfitted in honed white marble, much of which is laid in a mosaic pattern, a marble vanity featuring two sinks and accented in shimmery gold tiles, a whirlpool tub with low profile jets, separate shower, and windows overlooking the pool area. There’s even a lingerie and jewelry chest, a walk-in closet, and separate toilet and bidet area. The suite’s guest room is a sort of mini-suite of it’s own. 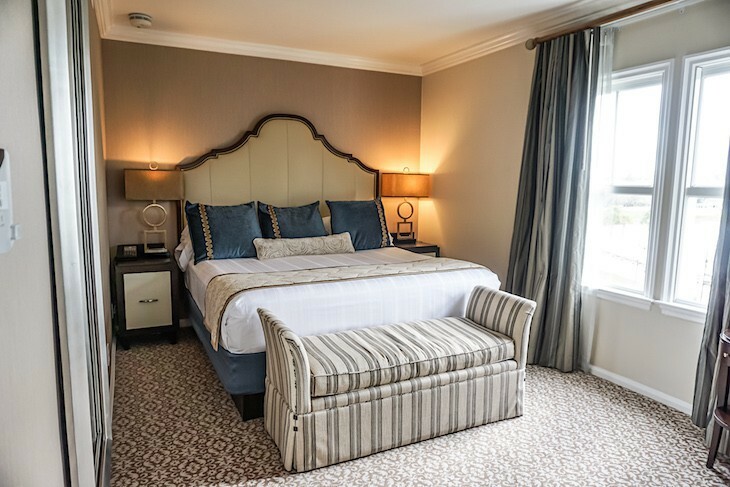 In the sleeping area are two queen beds adorned with soft gold and chenille beige pillows and a coral motif runner at in a gray and gold palette. In opposite corners sit an easy chair and small bureau with built-in TV. Best of all is a bonus sitting room with sofa, coffee table, and credenza with a large TV. Accessed from here is a very lengthy balcony which overlooks a quiet garden area. A walk-in closet and split standard-type bath is located between the sitting and sleeping areas. Also located on the fifth-floor is the cosy Vice Presidential Nantucket Suite perfect for romance. Sleeping only two in 996 square feet, this one-bedroom, one-and-a-half-bath suite offers a contemporary, understated beach look. The dove gray parlor holds a sea green chenille sofa, large coffee table, beige chenille easy chair, and, behind the sofa, a white desk with ocean blue chair. Within the living area is a bar, sparkling with a wall of mother-of-pearl tile, filled with wine glasses, a Keurig coffee maker, and undercounter refrigerator. Dine at the four-person table offset in an alcove, and enjoy entertainment while facing the mirrored-front credenza above which hangs an oversized flat panel TV. 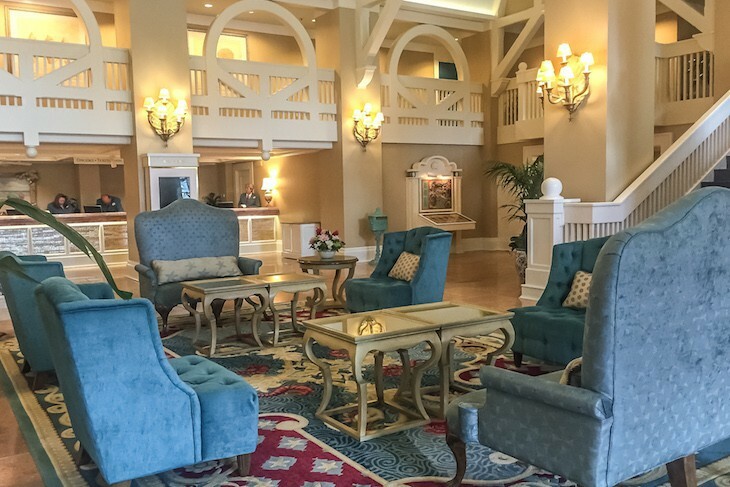 Your balcony overlooks Disney's Boardwalk and the back entrance to the resort. 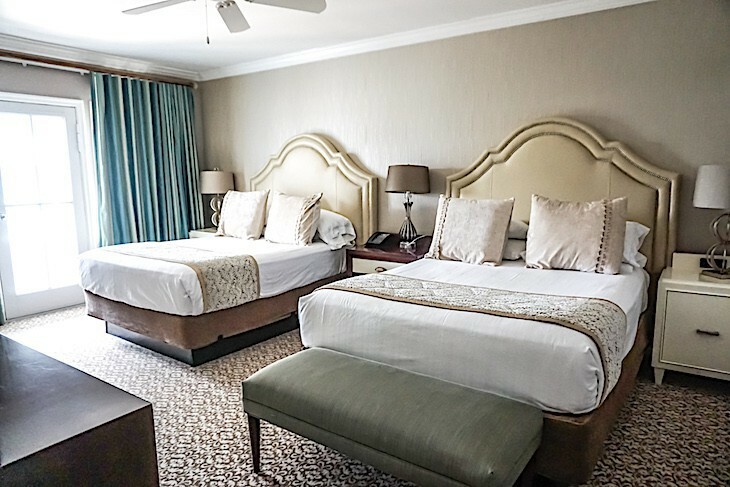 The lovely bedroom has a king bed with cream leather headboard, white sheeting, green silk throw pillows with gold accents, and sea green coral motif runner. In the bedroom’s sitting area are two easy chairs and a coffee table. Over the cream-colored bureau is another oversized TV, and a small, standing-room-only balcony faces a slice of Stormalong Bay. 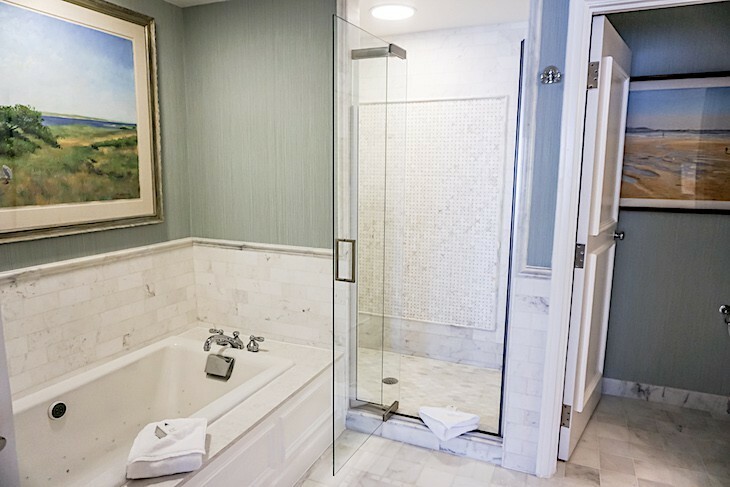 In the mosaic white marble bath are a whirlpool tub offset in an alcove, large separate shower, double sinks, lighted makeup mirror, and separate commode area. Off the entry hall is a half bath. 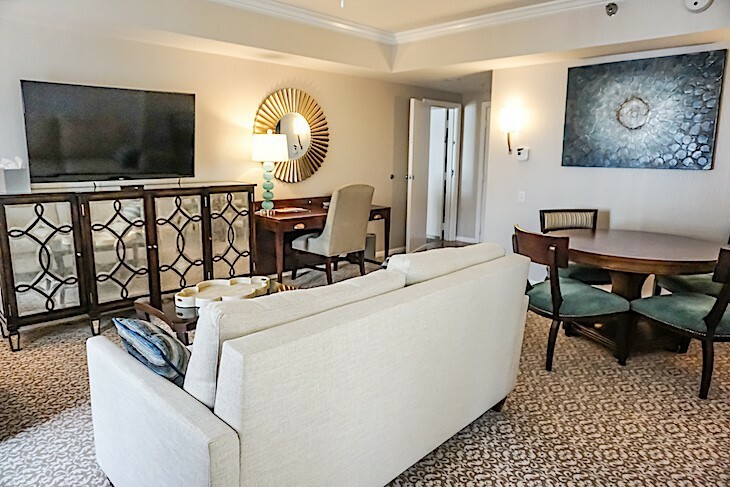 Enter two-bedroom suites through a small marble foyer to a nicely renovated living area with four-person dining table, creamy gold chenille sleeper sofa, easy chair, coffee table, a mirror-front credenza bureau above which is a wall-mounted TV, and desk. There is also a wet bar with Keurig coffeemaker and undercounter refrigerator. Between the living room and the master is a honed marble floored hallway with stand-up balcony leading to the master bath with two double sinks and a separate room with toilet and shower. On the other side of curtained French doors is the master bedroom with an oversized soft gold headboard, teal chenille throw pillows, large bureau, and occasional chair. 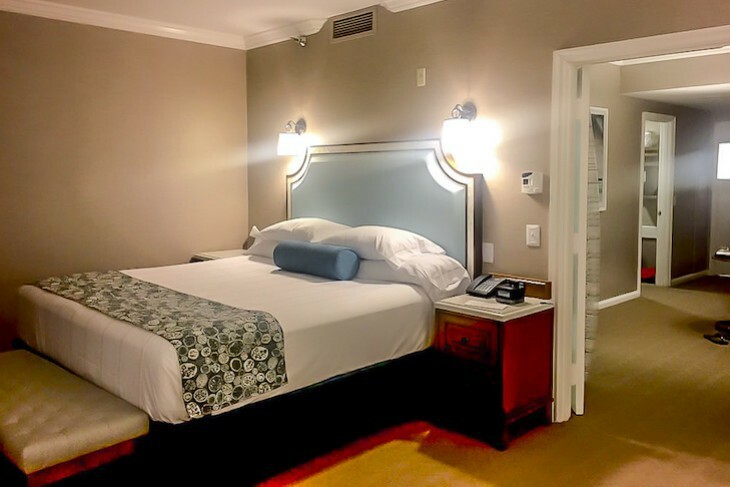 On the opposite side of the living area is standard-size guest room with upgraded decor (soft gold oversized headboards, creamy gold chenille throw pillows and gold/cream bed runners) two queen beds, and a full-size balcony. These accommodate a maximum of seven people in 1,095 square feet and are all located on floors one through four. Views vary of either the Boardwalk entrance of the resort with a slice of Crescent Lake and the pool, or a head-on view of Crescent Lake. 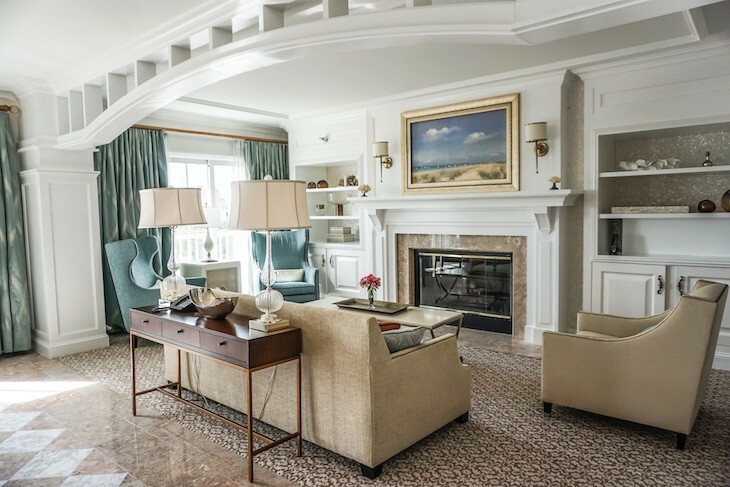 One-bedroom Suites at 571 square feet offer a small parlor with a cream and taupe-colored single sleeper sofa with sea blue accent pillows. 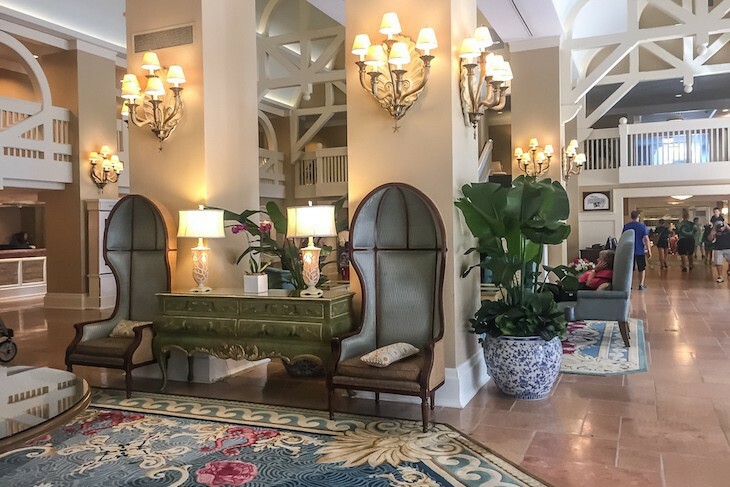 Framed seashell drawings adorn the room as well as a rattan oval coffee table, and flat-screen TV atop a bureau.Off the parlor is a patio or balcony - my last stay I was in a corner suite fronting the side and main back walkway of the resort, right next to the bridge leading to Epcot. Through French doors curtained with non-private, nautical-striped sheers, enter the bedroom with its king bed, desk, queen sleeper sofa, and second TV and undercounter refrigerator within an oversized bureau. Windows are covered in neutral-colored, canvas Roman shades. 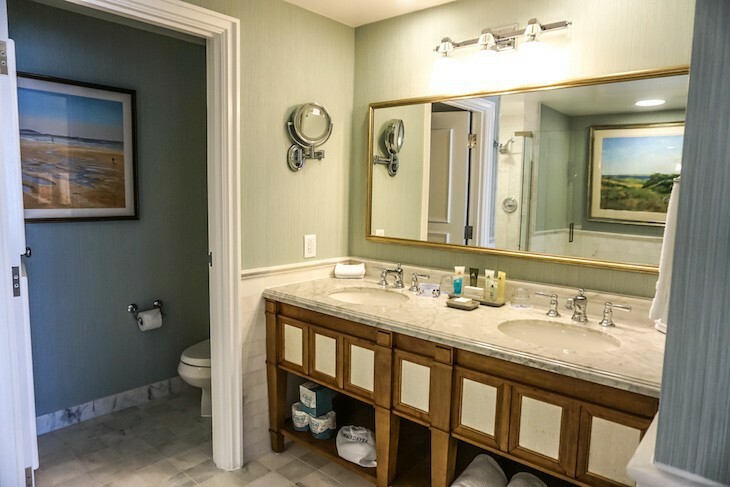 A standard-size bath with double sinks and a walk-in closet are located off the parlor. Sleeps five. All are located on floors one through four which requires quite a walk and an elevator ride to the concierge lounge. 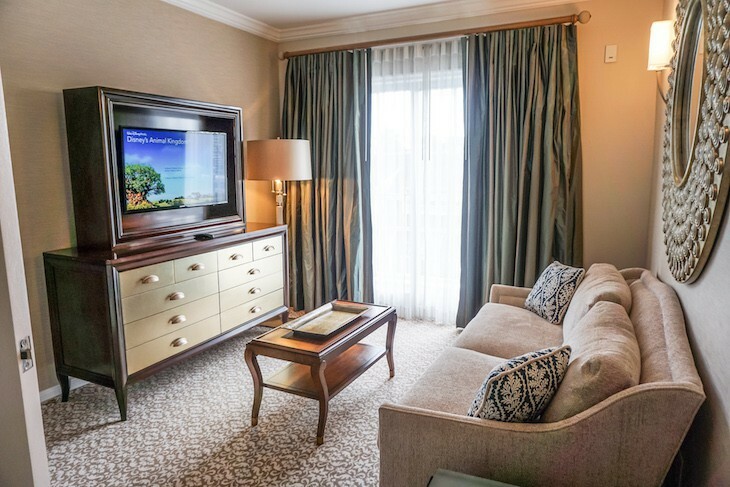 Deluxe Concierge Rooms are corner rooms found on every floor except the 5th. At 533 square feet and sleeping five people (even thought the bedding could sleep six), they afford extra room for a more comfortable stay in a wider, longer room with more space for moving around. Just past a small marble foyer is a standard-size bath, then the sleeping area with two queen beds, desk, and bureau with built-in TV. At the base of each bed is a bench topped with textured pale blue fabric. Set in a small alcove within the sleeping area is a queen sleeper sofa, easy chair, and coffee table. The small balcony is a stand-up only although it comes with a nice view of Crescent Lake – ask for the ground floor with a patio instead. 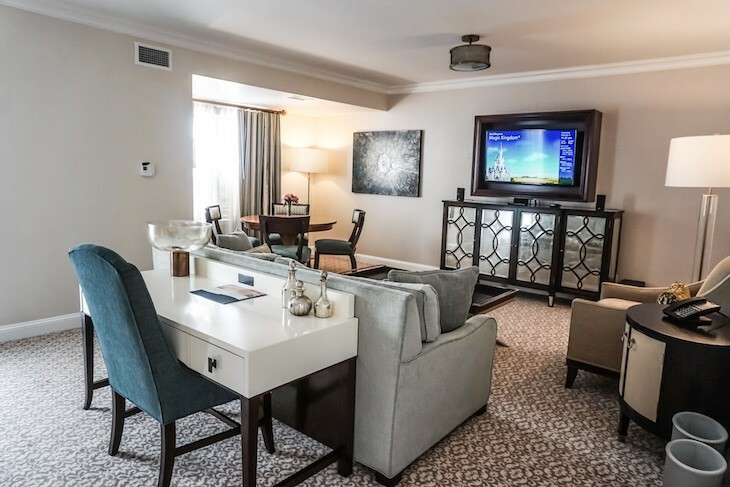 Interestingly enough the Deluxe Concierge Rooms are less expensive than a Water/pool View Concierge Room with only 400 square feet, the difference being that the Water/pool Concierge Rooms have a more convenient location on the 5th floor with easier access to the concierge lounge.